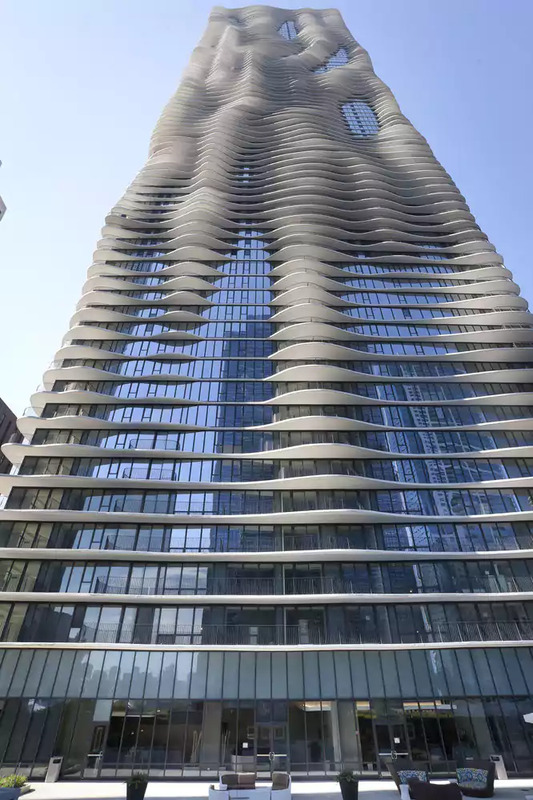 Aqua is an 82- story mixed-use residential skyscraper in the Lakeshore East Community development in downtown Chicago. The building contains 55,000 sq ft (5,100 m2) of retail and office space, in addition to 215 hotel rooms (floors 1-18), 476 rental residential units (floors 19-52), and 263 condominium units & penthouses (floors 53-81). Aqua is the first downtown building to combine condos, apartments and the Raddison Blu Hotel. Its outdoor terraces—which differ in shape from floor to floor based on criteria such as views, solar shading and dwelling size/type—create a strong connection to the outdoors and the city, as well as form the tower’s distinctive undulating appearance. Strategically sculpting the shape of each floor slab offers comfortable outdoor terraces, where neighbors can casually and comfortably interact when desired, as well as views to Chicago landmarks, navigating sight lines around the corners and through the gaps between existing buildings.